It has long been a favorite marketing ploy to brand oneself in a manner that can give the maximum level of appeal. For example, those people in favor of abortion rights call themselves “pro-choice” rather than “pro-abortion,” to move the conversation from the killing of a fetus to one about a woman’s right to choose. It is brilliant and effective. Over the past decade, the far-left liberal wing of the Democratic party began to make strides in taking over the party in both numbers and policy. As part of their hijacking the party leftward, they opted to re-brand themselves and their policies as “progressive” and “forward-leaning,” rather than “liberal.” The marketing maneuver was meant to demonstrate a path towards the future. In doing so, the liberals weren’t merely re-branding themselves, but trying to recast “conservatives” as older and backwards-thinking “deplorables,” to quote Hillary Clinton. The marketing continues to be retooled, post the Democrats loss in the 2016 presidential election. The Democrats are giving pause as to whether to continue its leftward shift and push the likes of socialists like Bernie Sanders, or Elizabeth Warren and Keith Ellison. Would emphasizing the perception of being a bunch of “coastal liberal latte-sipping politically-correct out-of-touch folks,” as Barack Obama said be a good strategy, or should the party pivot itself as caring about ALL people and opinions? Enter the next new thing for liberals: “pluralism.” It suggests a very wide tent open to all people and opinions – including conservatives. But it ain’t. It’s just more liberal policies and people advancing a new tagline to try to win an election. To be fair, it’s not just liberal politicians trying to win an election. It’s about all liberals who are trying to come to terms with their own biases. They still hate the people who “cling to guns and religion,” as Obama described, but by self-describing themselves as in favor of “pluralism,” they feel that they have pierced their liberal echo chamber. Of course, it’s a sham, and one that left-leaning Jewish groups are embracing wholeheartedly. Consider the Jewish organization the Shalom Hartman Institute. It proudly identifies itself as cross-denominational and calls for “radical pluralism.” Does it truly invite all people and opinions? Well, the group is run by a bunch of elite Ashkenazi intellectuals. Do the Israeli or American chapters have Haredis on its leadership team – the fastest growing group in Israel? No. Does it have a large number of Mizrachi Jews on its staff, representing the majority of Jews in Israel? No. How about any of the over 100,000 black Ethiopian Jews that have come to the country over the past few decades. Nope. There are more Muslims on staff than all three of those Jewish groups combined. But the left-leaning organization is working with left-leaning media outlets to advance the notion that it is pluralistic. The Hartman Institute is only pluralistic in the sense that it’s members come from different denominations of Judaism including Reconstructionist, Reform, Conservative and Open Orthodox, but it’s politics are liberal. 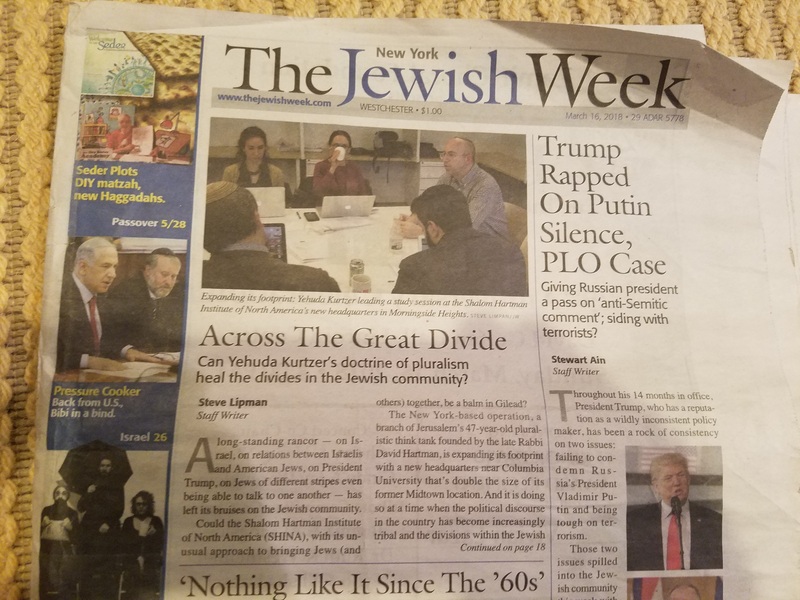 Consider one of its recent topics on “Jewish Canon and Male Privilege.” Is this really a pluralistic organization that is open to a wide range of views, or is it simply seeking to bring in more conservative people to listen to the liberal talking points? Will the SHI host a discussion about “The Bible’s Prohibition of Homosexual Relations,” or “Why are Muslims Much More anti-Semitic than Other Religions Today?” I highly doubt it. So it goes in the world with the word “pluralism.” The word is being co-opted by liberals and being stripped of its true meaning. And it is a shame. Because the world could really use some genuine dialogue. That comedy is the unfortunate reality of many liberal Jews when it comes to Israel. No matter. It identifies itself as progressive. Hartman said that he hoped that everyone would find a way to respect the various opinions and values as it relates to Judaism (which is easy to accomplish in the US), and in Israel (which is a much harder task). He alluded to “tools” and studies that the Institute developed to enable constructive dialogue and respect. He then took a few questions. His responses did not offer a particularly welcoming view of Israel. When was the last time that Finland fought in a war? World War II? When were terrorists launching missiles into 80% of the population centers of Canada? Have either Finland or Canada been threatened with annihilation and being wiped off of the map? Are terrorists firing into their countries from United Nations schools? If Hartman believes that Palestinian Arab leadership endorses terror, why is he dismissive of Israel’s defense? Why belittle the disproportionate DEFENSES of Israelis and Arabs? How can he suggest that the Israeli army should behave like a country that hasn’t been fired upon since 1945? Even if Hartman had no interest in hasbara, advocating on behalf of Israel, is it too problematic to acknowledge that Israel’s peers and neighbors are not the same? Another question posed of Rabbi Hartman related to his thoughts about a “demographic time bomb” in Israel that could threaten its position as a Jewish State and a democracy. He responded that there is no risk of the Arabs outnumbering Jews in pre-1967 borders (he advocates for giving up Judea and Samaria). He continued that the real demographic time bomb in Israel comes from the ultra-Orthodox (Charedi) community which has very large families. According to him, they are the real threat to the Zionism that he loves. 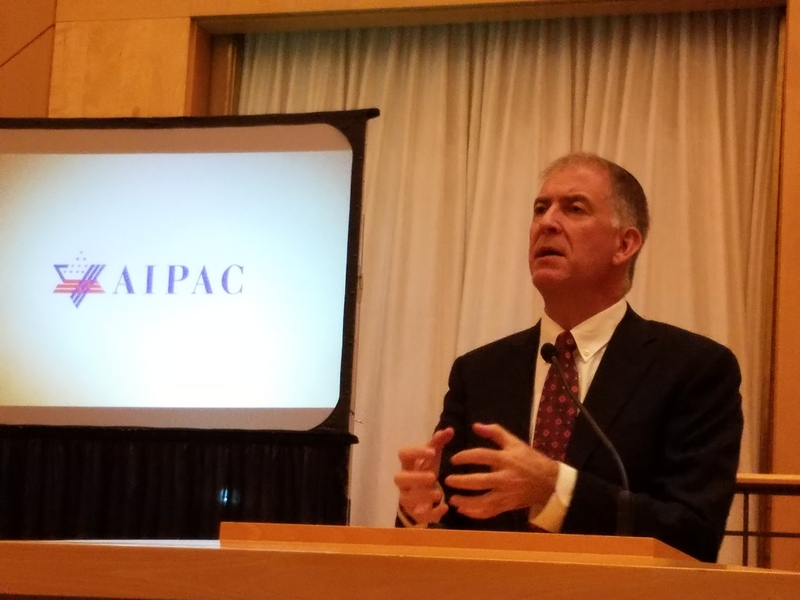 He assured the audience that the Hartman Institute is doing everything it can to advance a Jewish and democratic state that will minimize the corrosive effects that ultra-Orthodox Jews may have on the state. Quite a view from a “progressive” think tank. Its staff has more Arabs than Mizrachi Jews, while it seeks to undermine the viewpoints of Charedim. These liberals have excluded – by accident or design – the majority of Jews in the country (Mizrachi) while they develop thought pieces that will marginalize the fastest growing group of Jews (Charedi). These elitist Ashkenazi Jews then congratulate themselves on their progressive, open-minded ways. How? I don’t know. The Hartman Institute is not The Onion. Its leaders do not perform stand-up, and the speeches are not parodies. The institute stands as a progressive think tank that considers itself at the forefront of Jewish thought. And for some reason, it will not congratulate Israel on being the most liberal country for a thousand miles in any direction. American liberals, ensconced in their echo chambers, imagine a fictitious America, and Jewish liberals dream of an Israel that cannot exist in today’s reality. The former feels that America has fallen short by electing Donald Trump, while the latter refuses to believe that Israel is greater than it imagined. What each group of liberals has in common is the belief that it is enlightened and open to all points of view, even while ignoring the opinions of the majority. In a world of 7 billion people, there can be no surprise that people have different views. Even in smaller segments of society, whether in a small town or school, different people could look at a situation and arrive at very different conclusions. One story, two views. Conclusions may in turn generate additional comparisons. Once an opinion becomes anchored, another similar thought may come to mind. Over time, the two distinct ideas become linked together, in closely related parallel views. Two stories, one view. Much of the world followed the negotiations between six global powers and Iran over the latter’s nuclear ambitions. Not only did many people seek different outcomes, even people that sought the SAME outcomes, viewed the deal in completely different ways. Consider the Wall Street Journal and The New York Times. Presumably each American newspaper sought a deal which left Iran without nuclear weapons capability. On July 15, each paper ran factual headlines about the outcome of the negotiations. Yet the emphasis for each was extremely different. 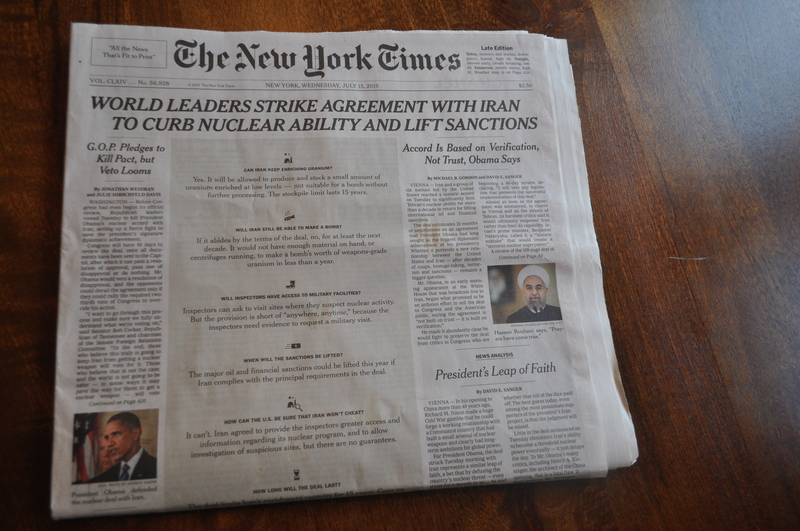 The headline for the NYT read: “World Leaders Strike Agreement with Iran to Curb Nuclear Ability and Lift Sanctions.” Sub-headers read “Accord is Based on Verification, Not Trust, Obama Says” and “G.O.P. Pledges to Kill Pact, But Veto Looms.” An article further down the page was entitled “President’s Leap of Faith“. In the middle of the front page the Times sought to summarize the deal terms in a Q&A format. For anyone reading the answers, it was clear that the deal offered few assurances that Iran was not going to have nuclear weapons within the decade, and certainty that they would have it after a decade. The portrayal was in sharp contrast to the front page of the WSJ. 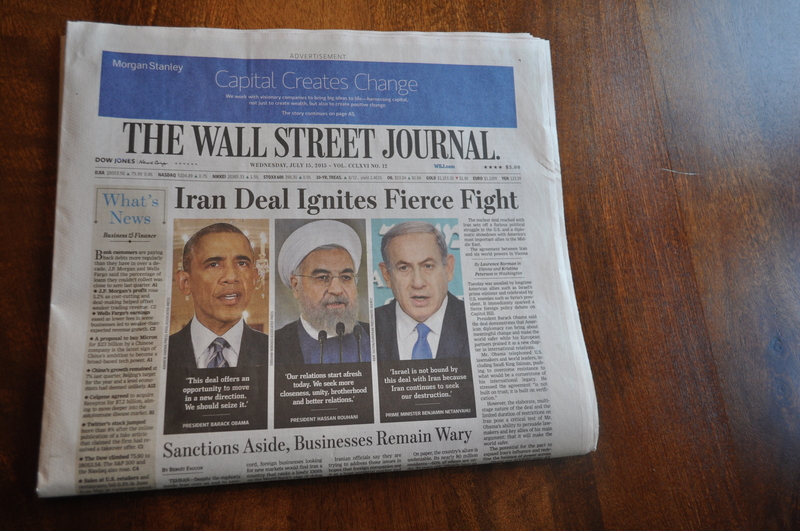 The WSJ also led with a factual headline about the reactions to the Iranian deal. “Iran Deal Ignites Fierce Fight” The paper included three large pictures with quotes from the leaders of the United States, Iran and Israel with their views on the deal terms. Both papers considered that Obama and Iranian leader Rouhani were happy with the deal. That was where the similarities ended. The Times called out the Republicans as being unhappy, while the Journal highlighted Israel’s unhappiness with the deal. One paper took a more domestic review of the international matter, while the other focused on the international fallout. The NYT used small font to review the dissent of the deal in language that could have been used to describe a capital gains tax hike, while the WSJ used large color photographs in the center of the paper to draw attention to the significant global ramifications of the agreement. The NYT seemed to tell its readership that if they had faith in Obama, they should have faith in this deal. The WSJ told its readership that a huge fight was brewing overseas, and the US aligned itself with an enemy state and against an ally. Two papers presumably started at the same spot seeking the same result, but moved in opposite directions when the negotiations concluded. Here was a leader of an organization that described itself as a “pluralistic center of research and education deepening and elevating the quality of Jewish life in Israel and around the world,” equating a Jew living with his family in Hebron, with an Iranian regime shouting “Death to Israel” while it obtained the green light from the world to have nuclear weapons in ten years. A champion of pluralism drew an equivalence between starkly different stories: Jews living freely in places they lived for thousands of years; and a country that has threatened -and will soon be armed for- a genocide. I understand different people having different opinions. I respect the concept that two parties can start at the same spot and move in opposite directions. Yet I struggle when a single person can conflate two completely different matters into a single narrative. The NYT loves Obama and feels that their trust and faith in him has prevailed over his presidency, so why not trust him again now? (Of course, that has nothing to do with trusting Iran, but the Times at least starts consistently). The WSJ has always pointed out the flaws of Obama’s foreign policies and used this bad Iranian deal to point it out again. But what of the leader of a “pluralistic” organization? Does being pluralistic mean that everything and everyone carry the same weight? Does the notion that “pluralism can mean that no full knowledge of truth is possible” mean that it can be so amazingly wrong to suggest that the “external existential threat” of an Iranian nuclear bomb is the same as a “self-imposed existential threat” of Jews living in Hebron? There is a logic to a liberal paper supporting a liberal president. One can agree to disagree. But how does one react to someone who distorts reality as if the world was a hall of mirrors perched atop a black hole? On Earth, we know opinions can diverge. In the ethereal world of “pluralism”, it would appear that accepting information from everywhere can lead to a singularity of stupidity.